Geo IoT World (Geo-location – Internet of Things) announces four award winners for innovation in geolocation technologies. GeoIoT is leading the way in showcasing the latest cutting-edge developments in this growth sector. The European GNSS Agency (GSA) sponsored one of the awards for ‘IoT Solutions Empowered by GNSS’. Sewio is proud to be mentioned by GSA (Global Satelite Systems Agency) in an article presenting results of Geo IoT Award. We are pleased to become the winner of the Innovator Award for IoT Networks and we thank the awards jury for appreciation Sewio RTLS Platform. The conference gathered 70 eminent speakers ranging from the smallest start-up to the industry giants. Along 16 thematic sessions, their insights, expertise and experiences gave bright perspectives for the Geo IoT techs and market. Among the key trends: Indoor Location technologies nearing maturity, beacons market taking off, precision GNSS high potential, asset tracking unlimited opportunities, not to mention also innovation areas in location intelligence and crowdsourcing, the whole being illustrated by a wide range of case studies. The Internet of Things enables manufacturers and service providers to exchange data and improve customer services, business performance and much, much more. In some ways, we have only scratched the surface of what can be offered. On tthe other hand conference presented deep insight to the variety of solutions, technologies and location-based services for the realization of IoT projects. Presented paper by Milan Simek has introduced The New Opportunities in Industry 4.0, Retail and Sport Markets opened by application of UWB Indoor RTLS. Milan Simek also presented the journey from UWB chip to final indoor positioning solution and gave the audience insight to the implementation of UWB RTLS in the Automotive manufacturing facility, Retail, and Sport. Focusing on UWB technology, Milan Simek proved why this technology drives the RTLS market thanks to precise and reliable indoor positioning and resistance in fully metallic environments. 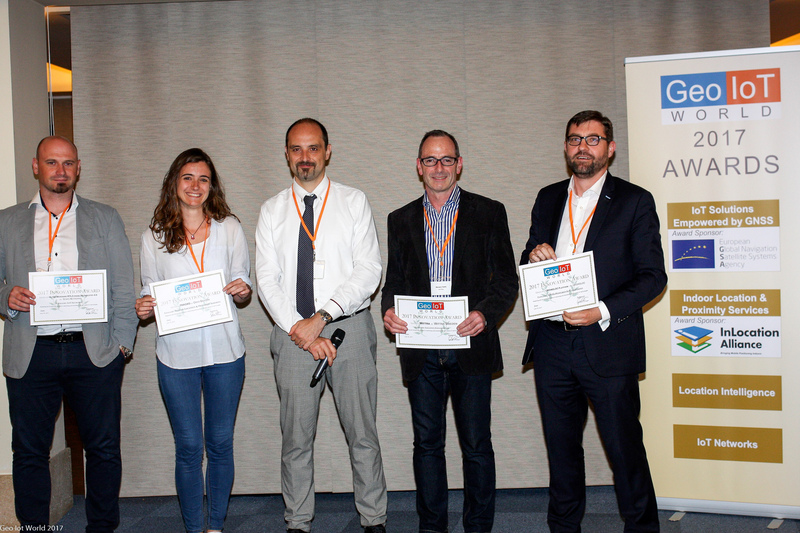 On June 7 evening, four innovators leveraging precision location technologies in IoT applications won a Geo IoT Award: CROWDLOC, Onyx Beacon, Sewio and Wittra. The full version of the article focusing on Geo IoT Award Winners is published by GNSSA (Global Navigation Satelite and System Agency) available Here. Learn more about Geo IoT World Conference. Sewio gained the award for innovations leveraging the location abilities of new IoT wireless networks such as LPWA, UWB technologies. Thanks to RTLS platform for real-time location tracking and movement digitization applicable in various environments. Are you interested in location technology for IoT projects?